The challenge continues with a recommendation of one movie from TCM's October line-up. A word about that line-up, it's a dandy! 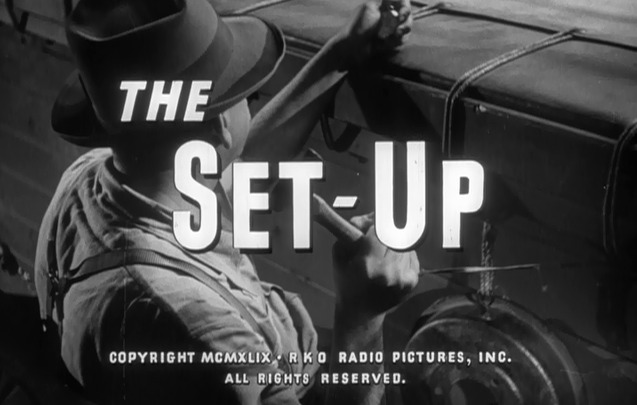 The 1949 release The Set-Up is my litmus test for film critics. If it is anywhere on any of their “tops” list, they pass muster. Local Toronto cable critics called it “an interesting little noir” upon its release in a Film Noir dvd set. Recently, a print critic for the Toronto Sun called The Set-Up a “second-tier boxing picture”. I approve of labels. They are a fine shorthand for the basis of understanding. However, someone who thinks they know all there is to know about film-noir may be disappointed at not finding a femme fatale in The Set-Up. Someone may read “boxing picture” and think to themselves, “I have seen Rocky.” A label is like a 10 second sound byte on the evening news. It hardly tells the whole story. The most important thing to note about The Set-Up is that it is a fine movie. The "real time" element is established at the beginning of the movie. The Set-Up is based on the epic poem of the same name by Joseph Moncure March. The poem published in 1928, and set in that tumultuous decade, details the story of Pansy, a black boxer with all the odds against him. Doomed not to reach the top because of jealousy and racism, he becomes a pawn of crooked gamblers after a prison term. The movie screenplay by Art Cohn has the contemporary setting of 1949 and our lead character Stoker Thomson is a white boxer, unable to accept that he is nearing the end of his career. True to his own personal code he fails to see the duplicity that surrounds him. It is fitting that director Robert Wise chose to film the story in real-time. He used his editor’s eye like a poet, choosing the perfect moments to put across the gritty and dramatic story. Prior to directing The Body Snatcher, his first feature film on his own, Wise attended acting classes to better understand the mindset and expectations of actors. The Set-Up provides viewers with a wonderful example of great ensemble performances. All the performers work together to create a cohesive sense of story, yet all get to shine individually. 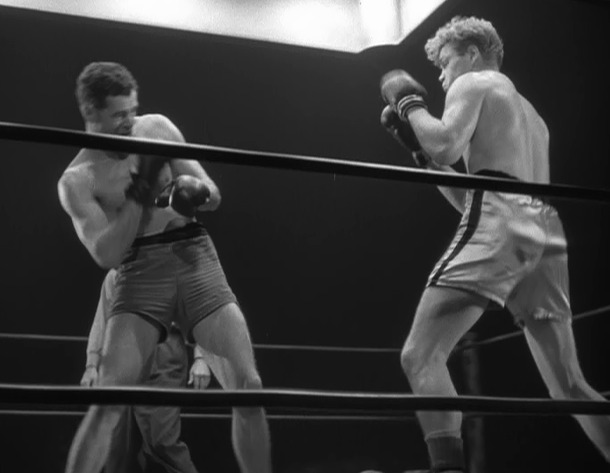 Journeyman boxer Stoker Thompson is holding on to a way of life he understands, while his wife Julie played by Audrey Totter wants a way out of what she sees as a dead end street. On the night we meet them, she must decide if the way out will be for both of them or only for herself. Her dilemma is heartbreaking. At the arena are others whose decisions will impact Stoker. His manager and trainer, George Tobias and Percy Helton, have made a deal with gangsters for Stoker to throw the evening’s fight. They haven’t let Stoker in on the deal because they don’t expect him to win. Stoker always fights to win and Alan Baxter as the sadistic gangster "Little Boy" is not a man to cross. We get to know and understand Stoker's "co-workers" including the punch-drunk "Gunboat" beautifully played by David Clarke, the anxious rookie Shanley played by Darryl Hickman, the sympathetic trainer Gus played by Wallace Ford, and the proud and ambitious Luther played by James Edwards. Ryan was a boxer at Dartmouth College and Baylor attended Washington State on an athletic scholarship. His pro boxing record was 15-8. The choreographed match in The Set-Up is a thing of authentic grit and beauty. 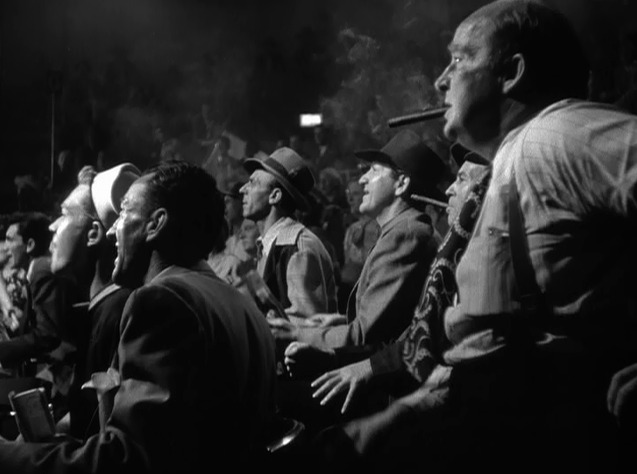 The crowd is a major part of the story as presented by Robert Wise. They are the reason the fights go on, the bums in the seats, the profit. They are no part of what goes on behind the ropes, the individual boxer's fight with himself. The loneliness in the crowded arena is matched by the loneliness of Julie's wait for another night, another fight to finish. We stroll with her through town, returning to another nondescript hotel room as she struggles with the most important decision of her life. The arena deserted after the fight where Stoker's victory places him in danger. The danger and the fear are uncomfortably palpable. In 73 minutes, we live a lifetime with the myriad characters of The Set-Up. 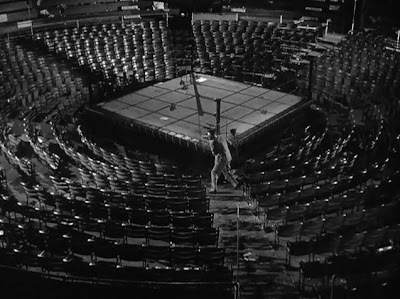 The setting is a boxing arena, yet we all face the same problems with the decisions we make versus the decisions that are made for us. The Set-Up is a movie of heightened emotions; uncertainty, fear, excitement, elation, despair, deceit, greed, ambition, hope, hurt, love. TCM is showing The Set-Up on October 11 at 4:15 pm. I agree. 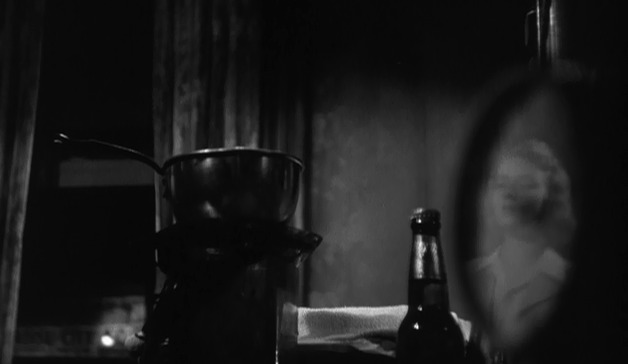 Robert Ryan is so often so very, very good that it's easy to take his work for granted. Stoker is a phenomenal performance in a movie filled with fine work. Yowza. Must see this one. New to me. Thanks so much for this sensitive intro. Jacqueline, I hope you are able to catch "The Set-Up". I look forward to hearing your thoughts. I've already got this one set up on my DVR to record, CW. It is one of my favorite Robert Ryan movies. He was such a fabulous actor, and this was a good example. TCM is also showing On Dangerous Ground, another great Ryan, and Beware, My Lovely, an unusual film noir with Ryan in an unusual part...I like this one so much I did a little post on it a while back. Thanks for the heads-up, and in my case I'm glad to say you are preaching to the choir. This is a movie any classic lover should see! Good write-up! A fabulous Robert Ryan film. He's a good guy here, but no-one could quite do menance and danger as well as Ryan. CW, wish the film makers could read your endorsement. It would certainly be satisfying to know their work is so thoroughly understood and appreciated. Becky, I don't know why TCM is saluting Robert Ryan in October, but I'm just going to sit back and enjoy it. When he's paired with Ida the screen is electric. Readerman, sometimes I want my rotten Ryan and sometimes I want my lovable Robert. He was one of the best at presenting both types of roles. Novabreeze, that's a very nice compliment. Thank you. I am taking your word for it and going for it. This is a fine film to highlight, CW. 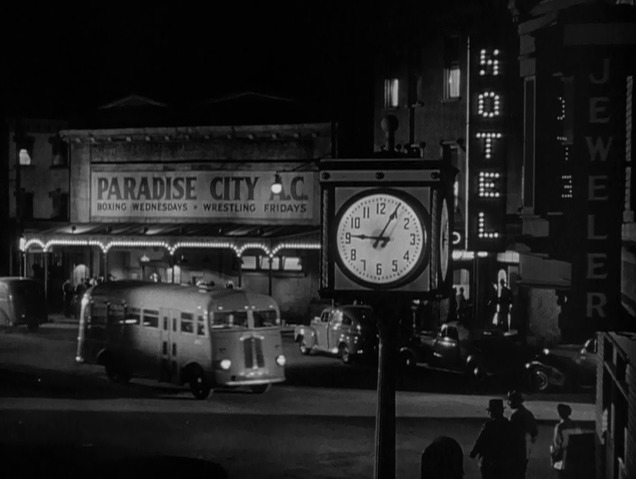 I love three things about it: (1) the real-time element which you addressed so well; (2) the portrait of a big city at night...it almost becomes another character; (3) and Audrey Totter's amazing performance. The whole cast is good, but she is fabulous! Well done review. I am confident that anyone named FlickChick is going to love "The Set-Up", and I'm also confident that you'll let me know either way. Rick, I don't think the world at large gives Audrey enough credit. In "The Set-Up", Julie is all internalized and given to us as Stoker is the only character she interacts with. Brava. 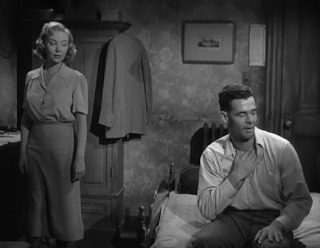 I'm not really a boxing fan, but.. when I saw that Robert Ryan and Audrey Totter, were going to perform in this dark and tense film. I had to watch it and then add it to my DVD collection. Exactly, Dawn. If critics want to promote the movie purely as a boxing picture someone who might enjoy it might give the movie a miss. Ryan and Totter are always a draw to those of discrimination and taste. Great pick! I wasn't aware of the background, thanks so much for including it. I'll add that I do love this one as a sports fan. You're right in that it's so much more, but if you are someone who wants a great boxing movie then absolutely don't miss this one! Yes, maybe you have seen Rocky, but I bet Stallone saw The Set-Up. Cliff, TCM sure didn't make it easy to choose one movie for October! 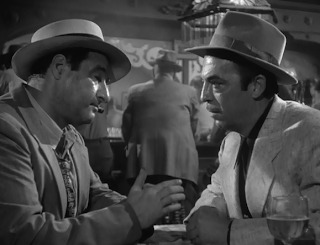 I have a relative who used to say of some recommendations "That's not one of those noirs you like, is it?" Now she can't get enough. Sometimes you think something is spinach when it's really souffle.